I had an excellent stay at the hotel. The Hotel Staff are very kind and friendly. The maior issues were - missing duvet - wardrobe door broken - missing bed table - dirty shower box floor ( still footprints from previous guests.. ) Enjoyed the breakfast with the options for expresso coffee and the comfortable bed. Dear Franz Johann B., Thank you for taking the time to tell us about your experience at the Mercure Florianopolis Centro Hotel. I am sorry that your experience did not meet your expectations; please allow me to express my sincerest apologies. At Mercure, we strive to provide a superior service experience for every customer; therefore your feedback is very important to us. Please rest assured that we are taking the appropriate measures to address the problem and prevent future occurrence. We appreciate your sharing your concerns, and it is our hope that you will give us the opportunity to better serve you in the near future. Sincerely, Leandro Jesus Hotel manager. I had the privilege to stay in the new room, and was wonderful!!!! Dear Ms Daniela Francescutti Martins H., We very much appreciate your comments regarding your stay at the Mercure Florianopolis Centro Hotel. It is always a pleasure to receive positive feedback. I will share your comments with our team. I am sure that this feedback will serve as an encouragement to all of our staff as we strive to continuously improve the quality of our services. Thank you again for sharing your experience, and we hope your next visit will be as pleasant as the previous one. Sincerely, Leandro Jesus Manager. Dear Marcio Gianini F., We very much appreciate your comments regarding your stay at the Mercure Florianopolis Centro Hotel. It is always a pleasure to receive positive feedback. I will share your comments with our team. I am sure that this feedback will serve as an encouragement to all of our staff as we strive to continuously improve the quality of our services. Sorry for the neighbor, the hotel is 100% not smoking, but, we can't avoid on the room. Thank you again for sharing your experience, and we hope your next visit will be as pleasant as the previous one. Sincerely, Leandro Jesus Hotel Manager. Dear Vania Cristina G., We very much appreciate your comments regarding your stay at the Mercure Florianopolis Centro Hotel. It is always a pleasure to receive positive feedback. I will share your comments with our team. I am sure that this feedback will serve as an encouragement to all of our staff as we strive to continuously improve the quality of our services. Thank you again for sharing your experience, and we hope your next visit will be as pleasant as the previous one. Sincerely, Leandro Jesus Manager. Good structure, expensive breakfast, broken shower. The hotel was good in overall matters. The pool was nice, room service was quick... We missed a few kitchen supplies and our shower was broken. Dear Luiz Gustavo Agostinho Franco B., We very much appreciate your comments regarding your stay at the Mercure Florianopolis Centro Hotel. It is always a pleasure to receive positive feedback. I will share your comments with our team. I am sure that this feedback will serve as an encouragement to all of our staff as we strive to continuously improve the quality of our services. Thank you again for sharing your experience, and we hope your next visit will be as pleasant as the previous one. Sincerely, Leandro Jesus Manager. Dear Erico De Paula C. N., We very much appreciate your comments regarding your stay at the Mercure Florianopolis Centro Hotel. It is always a pleasure to receive positive feedback. I will share your comments with our team. I am sure that this feedback will serve as an encouragement to all of our staff as we strive to continuously improve the quality of our services. Thank you again for sharing your experience, and we hope your next visit will be as pleasant as the previous one. Sincerely, Leandro Jesus Gerente Geral. I felt like the hotel employees care about me. Dear Carlos G., We very much appreciate your comments regarding your stay at the Mercure Florianopolis Centro Hotel. It is always a pleasure to receive positive feedback. I will share your comments with our team. I am sure that this feedback will serve as an encouragement to all of our staff as we strive to continuously improve the quality of our services. Thank you again for sharing your experience, and we hope your next visit will be as pleasant as the previous one. Sincerely, Leandro Jesus Hotel Manager. Dear Dr. Nilo Henrique Neves R., We very much appreciate your comments regarding your stay at the Mercure Florianopolis Centro Hotel. It is always a pleasure to receive positive feedback. I will share your comments with our team. I am sure that this feedback will serve as an encouragement to all of our staff as we strive to continuously improve the quality of our services. Thank you again for sharing your experience, and we hope your next visit will be as pleasant as the previous one. Sincerely, Leandro Jesus Hotel Manager. Estimado Sr. Alexandre P., Obrigado por sua fidelidade e atenção dispensada. Apreciamos imensamente seus comentários referentes sua hospedagem no Mercure Florianópolis Centro. É sempre um prazer receber impressões positivas. Seus comentários serão compartilhados com nossas equipes. Tenho certeza de que seu feedback será um encorajamento para continuarmos a melhorar a qualidade de nossos serviços. Agradecemos novamente por nos informar sobre sua experiência e esperamos que sua próxima visita seja tão agradável quanto a anterior. Sinceramente, Leandro Jesus Gerente Geral Mercure Florianópolis Centro. Prezada Josiane Ribeiro G., Agradecemos que tenha nos avaliado no seguimento da sua estada no Mercure Florianópolis Centro. Foi com prazer que recebemos seus elogios. Não deixaremos de partilhar os seus comentários com toda a equipe. A sua satisfação é a melhor recompensa para os nossos colaboradores que trabalham diariamente para lhe prestar um serviço irrepreensível. Por favor, compartilhe sua experiência no Trip Advisor. Temos certeza de que outros clientes apreciarão seus comentários. Segue link direto: https://www.tripadvisor.com.br/Hotel_Review-g303576-d299378-Reviews-Mercure_Florianopolis_Centro-Florianopolis_State_of_Santa_Catarina.html Na expectativa de a acolher de novo, queira aceitar os nossos melhores cumprimentos. Leandro Jesus Gerente Geral Mercure Florianópolis Centro. 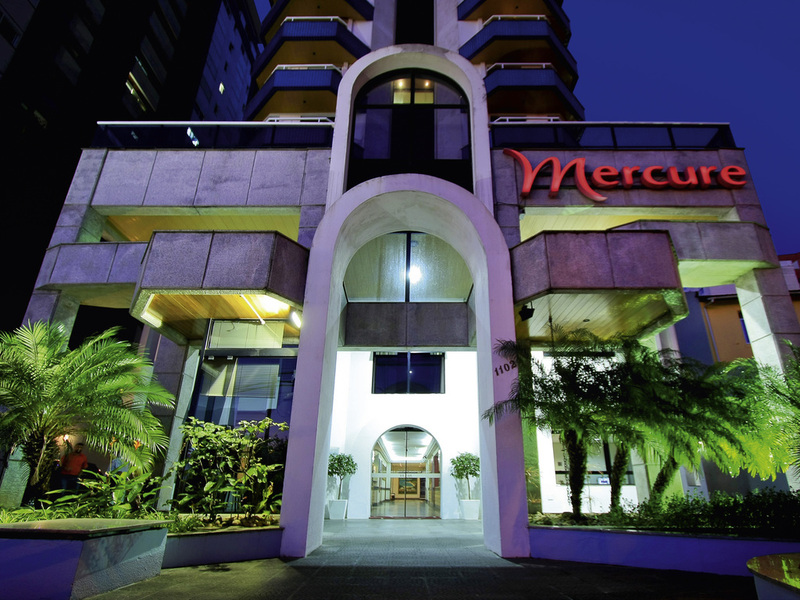 It's always a good experience staying at a Mercure and this time was no exception. The hotel is nice, the room was very comfortable, clean and silent. The staff was friedly and professional. The only 'no' was the restaurant experience. Although there the waiters were also extremelly polite and prepared, the food is shockingly overpriced for the place. The food is only OK, and the portions of some dishes are ridiculous. An example was the filet mignon , madeira sauce - I had never seen such a small steak, in an overall poorly served and small dish, for 65 reais (the same price of a very good bacalhau dish at a nice Portuguese restaurante near the hotel, just to compare). That experience was so bad I consider not returning to this hotel in future trips to Florianópolis. Dear Rogerio R., We very much appreciate your comments regarding your stay at the Mercure Florianopolis Centro Hotel. I will share your comments with our team. I am sure that this feedback will serve as an encouragement to all of our staff as we strive to continuously improve the quality of our services. Thank you again for sharing your experience. Sincerely, Leandro Jesus General Manager Mercure Florianópolis Centro. Dear Marcos S., Thank you for taking the time to tell us about your experience at the Mercure Florianopolis Centro Hotel. I am sorry that your experience did not meet your expectations; please allow me to express my sincerest apologies. At Mercure, we strive to provide a superior service experience for every customer; therefore your feedback is very important to us. Please rest assured that we are taking the appropriate measures to address the problem and prevent future occurrence. We appreciate your sharing your concerns, and it is our hope that you will give us the opportunity to better serve you in the near future. Sincerely, Leandro Jesus General Manager Mercure Florianópolis Centro. The experience was excellent. The hotel staff was great. Jonas (front desk), the pregnant lady (front desk) and Wilfreck Joseph (Housekeeper) were extremely helpful and always gave Service with a smile (especially Wilfreck). We were very happy with the apartment which was very spacious especially the bedroom. Security was excellent as well. The only 2 things I would change are: 1. Less sodium in the food in the restaurant 2. Not putting any alcohol in the refrigerator (not everyone drinks alcohol). I was actually offended by it. All in all, the stay was excellent. Thank You Mercure!!!! Dear Shamesha M., We very much appreciate your comments regarding your stay at the Mercure Florianopolis Centro Hotel. It is always a pleasure to receive positive feedback. I will share your comments with our team. I am sure that this feedback will serve as an encouragement to all of our staff as we strive to continuously improve the quality of our services. Thank you again for sharing your experience, and we hope your next visit will be as pleasant as the previous one. Sincerely, Leandro Jesus General Manager Mercure Florianópolis Centro. Air conditioning at living room not working everything looks old please take a look at the trash bin at the bathroom: old plastic, open, with supermarket plastic bag wrapped. Really dont you have money to buy a decent toilet paper trash bin? The TV is always rebooting and going to the 1st channel. Dear Adalberto Silveira P., Thank you for taking the time to tell us about your experience at the Mercure Florianopolis Centro Hotel. I am sorry that your experience did not meet your expectations; please allow me to express my sincerest apologies. At Mercure, we strive to provide a superior service experience for every customer; therefore your feedback is very important to us. Please rest assured that we are taking the appropriate measures to address the problem and prevent future occurrence. We appreciate your sharing your concerns, and it is our hope that you will give us the opportunity to better serve you in the near future. Sincerely, Leandro Jesus General Manager Mercure Florianópolis Centro.